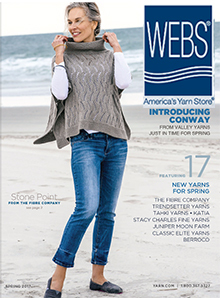 Webs America's Yarn Store catalog is a second-generation, family owned business. WEBS has been the destination for knitters, weavers and spinners for over 30 years. They are the complete source for spinning, weaving, and knitting yarn, equipment, weaving looms, accessories and books and patterns. WEBS carries nearly every major brand of knitting yarn, needles and supplies. They also offer their own line of yarn called Valley Yarns. These are incredible first quality yarns imported from all over the world and offered with great site-wide savings. Your savings will be applied automatically on Webs - America's Yarn Store's checkout cart.